Mandy Goff is in Birmingham to help her team pursue their Olympic dreams. As manager of the U.S. Wheelchair Rugby Team, Goff is about to lead her team into battle for the second Paralympic Games, this year in Rio de Janeiro, with the full support of the Lakeshore Foundation, an official U.S. Paralympic training site in Birmingham for the rugby team and other disabled athletes. Lakeshore Foundation has been a special place for Birmingham since it was founded in the 1970s as a rehabilitation hospital for HealthSouth Corp. It quickly became a leading resource and advocate for individuals with disabilities throughout the community, helping them lead a healthy, active lifestyle. Today, Lakeshore is a key component of the U.S. Olympic Committee (USOC), geared toward serving Olympic and Paralympic athletes. A number of athletes currently training in Birmingham will compete in the Paralympics in Brazil, beginning September 7. With its roots in wheelchair basketball, Lakeshore is a logical choice to train for the U.S. Paralympics. Individual athletes who’ve trained at Lakeshore and are participating in the 2016 Rio Paralympics include Josh Roberts, a Morris, Ala., native and Jennifer Schuble, a Homewood resident. This will be Roberts’ third time competing in the Paralympic Games, specializing in the 100 meter and 1,500 meter sprint events. Schuble is a five-time medalist in the Paralympic games and will compete in five cycling events at the Rio 2016 Paralympics. 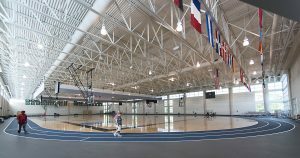 Several other Paralympic teams train at Lakeshore Foundation, including the U.S. Paralympic Men’s Wheelchair Basketball Team, the U.S. Paralympic Women’s Wheelchair Basketball Team, the U.S. Paralympic Women’s Goalball Team and the U.S. Paralympic Wheelchair Rugby Team. The U.S. Wheelchair Rugby Team, led by James Gumbert and Lakeshore’s Goff, received a bronze medal at the London 2012 Paralympics and currently holds the No. 1 world ranking. Lakeshore has played a large role in producing 52 Paralympic athletes, coaches and staff from across the country who have captured 30 Paralympic medals. The Lakeshore Foundation is a viable force in the Birmingham community through outreach and research programs as well. 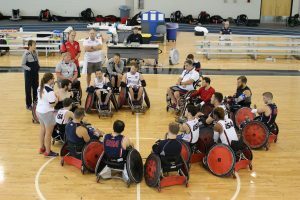 While training in Birmingham earlier this month, members of the U.S. Paralympic Wheelchair Rugby team spent their last day of training in Birmingham visiting Children’s Hospital speaking with youth about how to overcome adversity when faced with life’s hardest battles. As a result, Lakeshore has been recognized for its innovative work. The U.S. Olympic Committee has awarded Lakeshore “The Rings of Gold Award” for the best youth sports program for kids with disabilities and its “Amazing Partner Award” for having one of the strongest community based sports programs for children with disabilities. The foundation has also received the “Live the Dream Award” from the Birmingham Regional Chamber of Commerce, the predecessor to the Birmingham Business Alliance, and the “Friends of Children Award” from Children’s Hospital of Alabama.